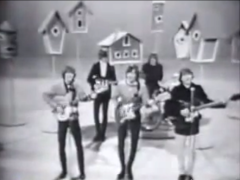 After seeing Roger McGuinn perform in concert in 2006, I was looking at old videos of the band The Byrds on YouTube. 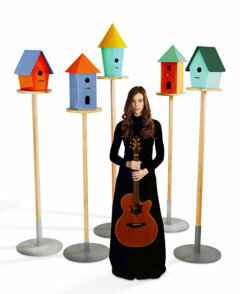 One showed them performing ‘Mr Tambourine Man’ on American television in 1965, against a backdrop of quirky bird houses. 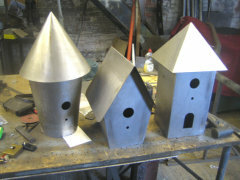 I was working on some garden-related pieces at the time and so I decided to make a range of ‘Byrdhouses’. This is the result. 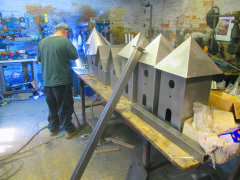 The houses are made in sheet steel which is cut on a CNC machine and then assembled by 'Bashing' Billy Jefferson at his workshop in Warwickshire. 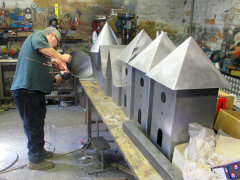 Each bird house is coated in a zinc-rich primer (to deter rust) and is then powder-coated in the colours shown. There is wooden insulation in the roof of each house (to prevent overheating); the posts are in oak and fit into metal ground stakes. 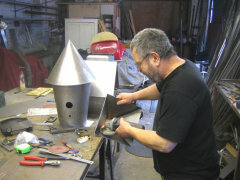 Customers' choice of colours can be produced to special order. 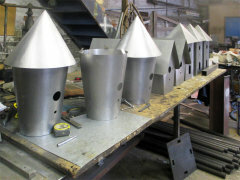 These bird houses have proved very popular and I've sold them to customers in Japan, Scandinavia, Germany, and America, as well as here in the UK. People ask 'do the birds like them' - the answer is yes, several customers have sent messages saying that the houses are occupied. It seems that the birds just look in the first year, and, if they fancy it, take up residence in the second season. 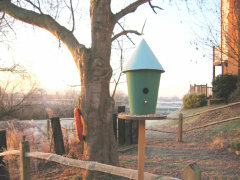 In 2009 the bird houses appeared in a music video made by the singer-songwriter Jo Hamilton (thus bringing the Byrds / music video connection full circle), and in 2011 they were featured in the book 1000 Designs for the Garden by Ian and Geraldine Rudge. 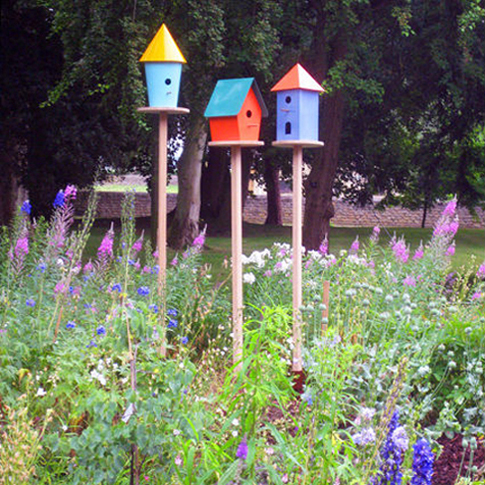 Later in 2011 I was invited to exhibit a group of bird houses at Yorkshire Sculpture Park. Recently I've supplied some in shades of grey for Steven Spielberg's desert garden in California, and also some wall-mounted versions for a gallery in Hamburg.